Pharaoh ants were imported from the tropics hundreds of years ago and have since adapted themselves to living indoors. They are very small ants, measuring from 1/15″ to 1/12″. Their coloring is light yellowish to reddish-brown. To easily distinguish pharaoh ants from thief ants, look for the presence of three segments in the antennal club. Sexually mature individuals of both sexes bear wings, but cannot fly; therefore swarms are never seen. They are found in localized regions throughout the United States and all the way up to southern Canada. 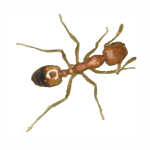 Pharaoh ants prefer high temperature and high humidity areas. They can be found in homes, apartments, grocery stores, restaurants, hospitals, and nursing homes. Because of their small size and appetite for many types of food, they are a very hard pest to control. Nests are rarely found, but they occur between walls, above ceilings, under floors, behind baseboards, in old trash, and in folded linens. Outside, nests occur in gardens and along walks. In warmer climates, especially with high humidity levels, pharaoh ants are most commonly found outside. They can be seen foraging and nesting on the sides of buildings, in adjacent landscape areas, or around sprinkler systems. What is the Biology of Pharaoh Ants? Unlike most other ant species, pharaoh ants have many queens in a colony. The ants develop in several colonies in nests and live amicably together. The colonies form one big aggregate nest that may contain many workers–anywhere from tens to hundreds of thousands. As the nest becomes larger and larger, the workers will evacuate the nest along with eggs and larvae to begin building new colonies. These migrations may occur at any time of the year, whenever a nest begins to become overcrowded. Since the ants are relatively unaffected by the seasons, sexual forms are produced and found throughout the year. A young queen may lay up to 300 eggs. The eggs hatch into legless larvae in 7 ½ days and are fed by the queen through the process of trophallaxis. Unless searching for food herself, the queen will stay in the nest and rely on workers to find nourishment. After 18 days, the larvae are fully grown. Then, they enter a 9-day pupal stage. The pupal stage leads to the worker stage, which takes approximately 38 days to complete. The worker pharaoh ants are sterile females. Their duties to the nest include providing nourishment for the young and the queens. Also, they work to keep the nest sanitized. Fertile males and females are occasionally produced from large, well-fed larvae. Ant mating usually takes place in wall spaces and crevices of infested buildings. This mating is never observed due to the fact that the sexual forms are unable to fly. The term “food preference” is almost inapplicable to these ants because of their all-encompassing appetite. For the purpose of narrowing the list, they seem to have an affinity for syrup, honey, cakes, jelly, fruit juice, greases, dead insects, meats, and blood.